Beauty squad goes to Laguna! Beauty Squad on The Go (“BSOTG”) is a collaboration of three beautiful women who share the same enthusiasm and passion in beauty and makeup artistry. The Squad aims to bring out the natural beauty of women and encourage them to embrace their individuality by giving them practical, relevant and safe beauty advice. 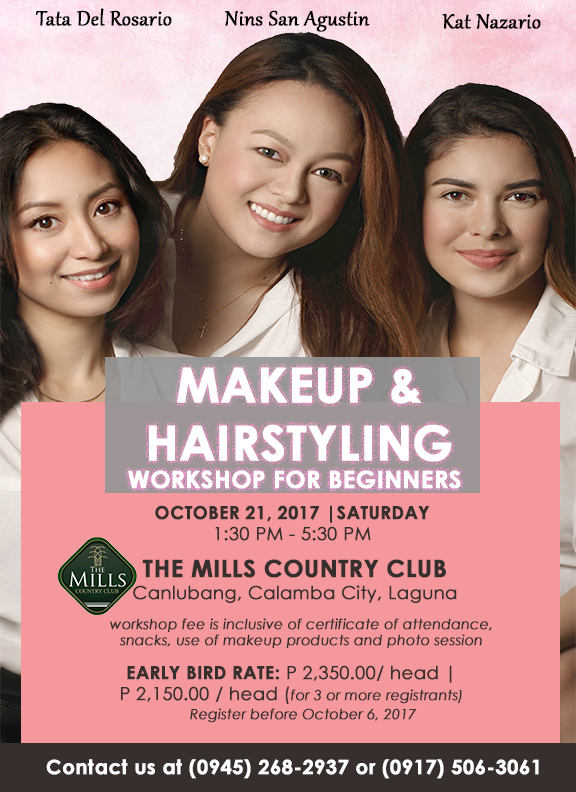 Join Reese Del Rosario (Lemons to Lemonades Project), Kat Nazario (Makeup Project by Kat) and, Nins San Agustin (Naturale by Nins) on Saturday, October 21, 2017 for a Makeup and Hair-styling Tutorial at The Mills Country Club. Limited slots will be offered, Only Php 500.00 to reserve.